The types of writing that I do are varied and intended for different audiences but the way I focus for each is similar. For the past 16 years, I’ve written a weekly column for our community newspaper, The Washington Missourian. In the past, I’ve written travel articles for The Missourian, and profiles of folks in our area for the Senior Life Times. Another type of writing I do is for The Missouri Press Association, serial stories that have appeared in newspapers across the United States, and led to the publication of two of my books based on the serials, "Twist of Fate, the Miracle Colt and His Friends," and “Patriotic Pals, Tails of Civil War Dogs." There are other assignments that vie for my time as well, posting about book news and reviews on MO Books, the Missourian’s blog at emissourian.com, and on a blog on my website, chrisstuckenschneider.com. Because I write in my home office, I’m fortunate to enjoy quiet, no radio or television disrupting my concentration. I also write shoeless, cranking up a small space heater if it’s a blustery day. Without shoes, I feel less restricted—surely I’m not the only writer to be a bit quirky? Once an idea hits—please let an idea hit—there’s research involved to ground myself in a subject. Often this not only requires going to the library and seeking reliable sites on the Internet, but also conducting interviews if I’m working on a book or a people profile for my column. Saying what I mean necessitates plenty of time for revision, my favorite part of the writing process, other than the magic moments when I have a break through and move from feeling like “I’m going to fail this time,” to “Wow, where did that come from?” I despise this ongoing doubt, but recently heard author Alice Hoffman, who has written more than 30 novels, say each time she begins a new one she has no idea how to get started. Writing is all about sticking to it—suiting up and heading for the computer, writing through the doubt. The reward is an aura of mystic that sometimes comes like a gift when I’m immersed and clicking away on the keyboard, a sense that something hovers on the edge of my consciousness and carries me along. I love it when that happens—it’s totally spontaneous and never ceases to amaze me. 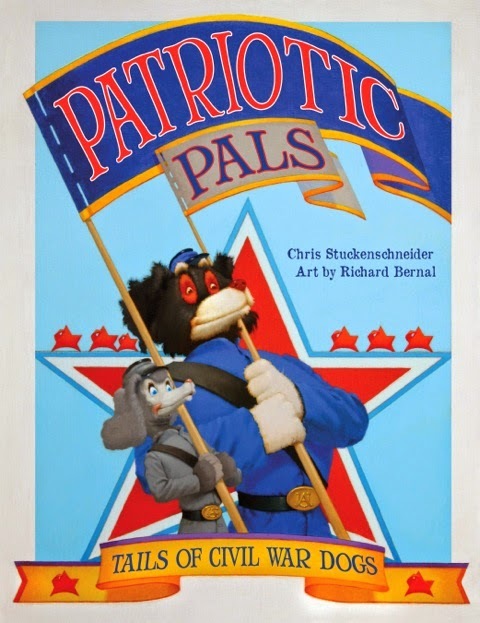 ABOUT CHRIS: Chris Stuckenschneider is the author of two children’s books—“Patriot Pals: Tails of Civil War Dogs,” with art by Richard Bernal, published in 2013, and “Twist of Fate, the Miracle Colt and His Friends,” a Missouri Show-Me Award Winner, in 2011-2012. A columnist and book editor at The Washington Missourian for the past 16 years, Stuckenschneider also coordinates Book Buzz with her colleague Dawn Kitchell. The award-winning newspaper column for children has become a community-wide service project that has provided more than 10,000 new hardcover books to schools in the Missourian’s readership. Book Buzz is distributed at no charge to newspapers across the United States by the Missouri Press Foundation. 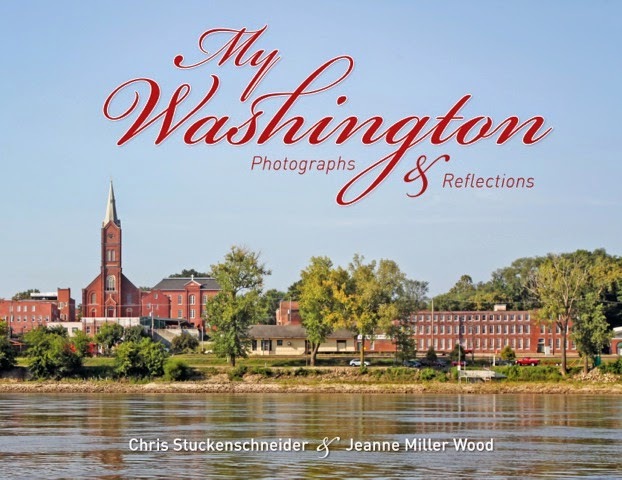 Stuckenschneider has called Washington, MO., home for over forty years and in February 2014 co-authored a coffee table book with Jeanne Miller Wood, photo editor at the Washington Missourian. “My Washington, Photographs and Reflections” celebrates Washington’s 175 anniversary. Stuckenschneider’s books are published by Reedy Press, St. Louis, MO. TWIST OF FATE -- A truck careened along the Missouri interstate on a starless night carrying 42 horses destined for a slaughterhouse in Dekalb, Illinois. Suddenly without warning, the truck failed to manage a curve on I-44. Brakes squealed, and the top-heavy trailer lurched and crashed to its side. Twenty-six animals survived that night. 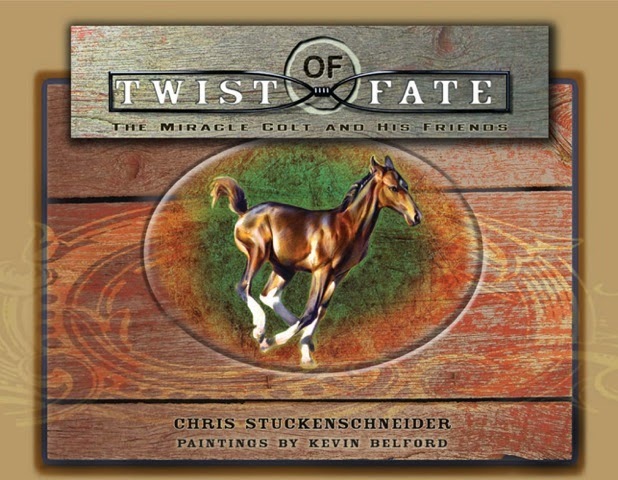 Told by Twister, an unborn colt at the time of the accident, the new children’s book Twist of Fate: The Miracle Colt and His Friends (published by Reedy Press) highlightsthe experiences of some of the surviving horses and their care at Longmeadow Rescue Ranch outside Union, Missouri. Author Chris Stuckenschneider imagines a thoughtful, unassuming voice that shares the story of Twister’s birth and his new life at Longmeadow, a haven for rescued and abused farm animals. Resplendent scenes of the 165-acre farm, rendered in paintings by Kevin Belford, show Twister making friends and discovering his surroundings amid lush hills and meadows. 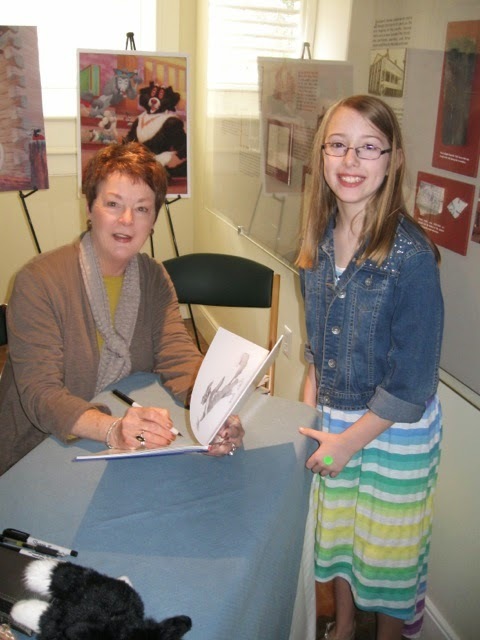 Twist of Fate not only delivers an inspiring tale, the book teaches as it entertains. The author intersperses sidebars about five other amazing horses rescued at the accident and taken to Longmeadow. Readers also learn about the ranch itself—operated by the Humane Society of Missouri-- where care is provided for countless abused and neglected farm animals. The book concludes with an invitation to visit the ranch. PATRIOTIC PALS -- Chuck, a sensible Border Collie from Missouri, and his poodle sidekick Tilly, reveal little-known stories about hero dogs of the Civil War in Patriotic Pals (Reedy Press). Chuck and Tilly go on a multi-state road trip that begins in the key Union city of St. Louis. On their educational and entertaining journey, they encounter legendary dogs from the war, including Big Brutus, the saluting Newfoundland who earned his stripes at Antietam, as well as Abe Lincoln’s beloved mutt Fido. This beautifully illustrated children’s picture book depicts vivid scenes of past and present. Children (grades 4-6) will learn plenty about the Civil War throughout—not just dates and locations—but also the importance of canine cohorts as warriors, mascots, and, of course, man’s best friend. More than 400 newspapers nationwide published Patriotic Pals as a serialized story in 2012. MY WASHINGTON -- Founded in 1839 and located on the banks of the Missouri River, Washington, Missouri, is a community that retains its old-world charm while embracing change with an eye to the future. My Washington: Photographs and Reflections (Reedy Press), a lavishly illustrated coffee-table volume, features photographs of local landmarks and favorite spots, as well as heartfelt sentiments about the town from more than 150 citizens proud to call the community home. People of all walks of life— neighborhood butchers, bank presidents, students, college grads who’ve returned to raise their children—share their perspective on what makes Washington special. Longtime residents offer their memories, too, as they revisit double features at the Calvin Theater, enjoy ice cream sundaes at Schroeder Drugs, and meet friends at Buds games. Interviews by Chris Stuckenschneider give context to gorgeous scenes depicted by photographer Jeanne Miller Wood. A limited- edition book, My Washington serves as a tribute to the community on its 175th anniversary.